Tuesday of last week proved to be just as eventful as Monday with a full program in my new community. After an interesting episode with a malfunctioning showerhead, I got cleaned up, put on my tie and met a few students from the day before in the Cantina shortly after daybreak. Breakfast consisted of boiled coffee, mint tea (which is amazing), lots of bread, cheese and a bologna type processed meat. The staff of the Cantina “rolled out the red carpet” as it were, by setting a special table in the dinning hall with an offset red tablecloth. The students typically go up to the cafeteria window for their food, but the kitchen staff insisted on either bringing my plate to me themselves or having the students do so. This may have something to do with the fact that, in effort to assist my classroom command over the student body, my counterpart made it known that I was a “very important” individual from the United States. Let’s hope this clever disciplinary tactic holds strong in the classroom too. Next, my counterparts gave me a tour inside the various school buildings. As mentioned earlier, most are remodeled and quite clean, well organized and much like what I would expect from a school in the United States. There are three computer labs with flat screen monitors, several classrooms have projectors, and one even has a SmartBoard. There is a small gym with some basic equipment for the students and a ping-pong table. Separate for the teachers and staff, there is a fitness center, of which I have been given a key, but not actually seen. Though the Activities Director made sure that I knew it was off limits to students because the equipment was of quality and repair resources for it in Romania are scarce. The main schoolhouse has a large auditorium with a stage, another projector and rows of seats for students and/or staff. There are also several functioning classroom laboratories setup for the students with quality microscopes, various digital and analog equipment and other tools for the students to experiment and gain hands on instruction with. While visiting Tuesday, I was invited to sit in on a couple laboratory lessons, the first was on “The clinical examination of pets” and the second on “The microbiological analysis of different types of yeast”; both sessions were quite interesting. The former included a full-grown, live rabbit. The program Diriginte (Headmaster) led the class with a mock case study in which the students had to identify an illness based on a list of certain symptoms. Each student was wearing a white laboratory coat and they shared an electronic stethoscope. 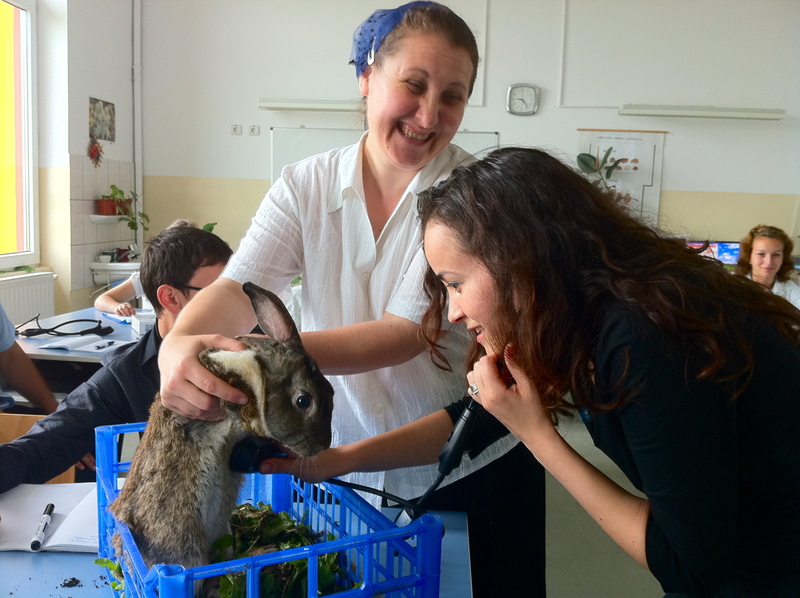 After the case studies, the Diriginte demonstrated how to carefully exam the rabbit, looking over the fur coat, checking the ears and listening to various parts of it’s body with the stethoscope. Then, one by one each student followed the instructor’s lead and examined the rabbit. This brought on roars of laughter as some students were apprehensive about getting to close to the fluffy grey bunny, perhaps because they had seen Donnie Darko too many times. One of my counterparts was in fact brave enough and seemed to thoroughly enjoy the experience. I was quite content to watch from the sidelines, as I am rather fond of the taste of roasted rabbit and would just as soon maintain the divide between the living specimen and that on my dinner plate. The second session on the topic of yeast, ties into the making of bread, beer, wine etc. Again, each student was dressed in a white laboratory coat and one by one visited the electronic microscope at the front of the room. Typically, the device is connected to a projector so the students can see the results in real-time, all together, but for one reason or another this functionality wasn’t working on this particular day. The teacher prepared several slides at the various stages of yeast development and the students oohed and aahed as the yeast seem to grow before their eyes. This was one experiment I wanted to get in on and as a bonus for participating I was given a small packet of dry yeast for bread making; see volunteerism does pay off. In-between the two laboratory lessons, my lead counterpart held a session with her students on Romanian literature, “Epical models in time between the two World Wars”. 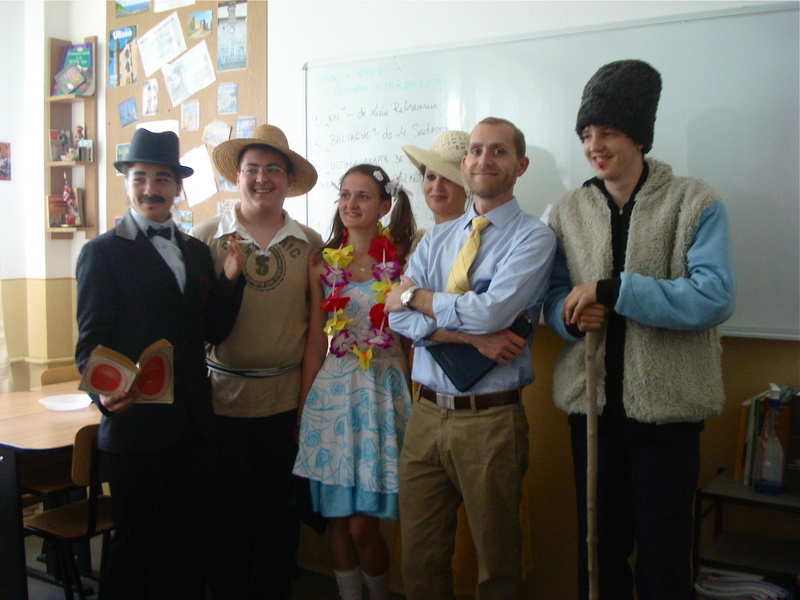 The session began with five students dressing up in period costumes and portraying various characters in the books they had reviewed earlier in the year. Each of the volunteer actors came strutting into the room with lines of dialog memorized and perfectly executed acting. After the class identified each character, the instructor moved on to project various clips from movies created from the corresponding Romanian classic. This session was definitely one of my favorites as the students were fully engaged in the multifaceted lesson plan. 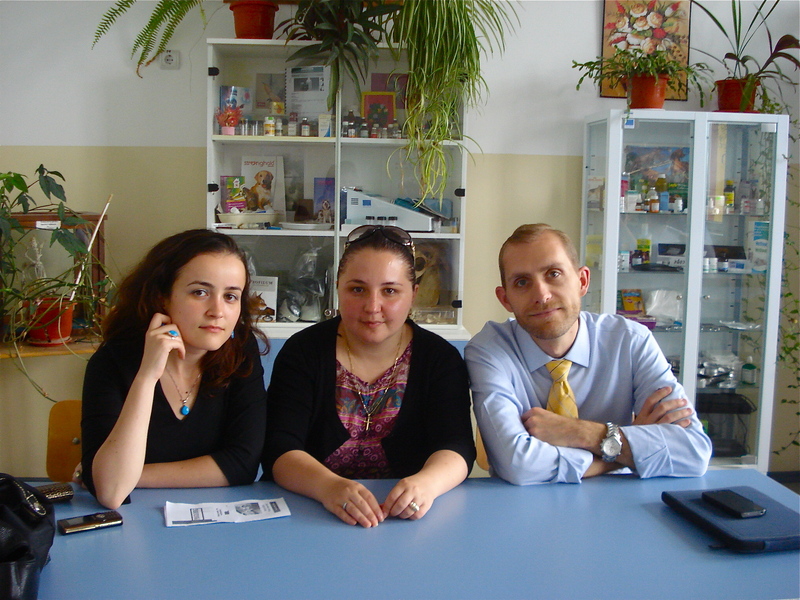 Before lunch, we went to visit the Primaria (Mayor’s Office) and had a thirty-minute conversation with the Mayor of Valea Călugărească. An energetic and confident middle-aged gentleman, he was particularly attentive to our conversation as next year is an election year. We introduced him to the Peace Corps’ three goals, discussed what the main duties of my assignment at the school were to include and reviewed our options for possible secondary community based activities to which I could contribute. The Mayor seemed genuinely impressed with the American sense of adventure and altruism that Peace Corps embodies. Through translation, he invited us to visit the village’s newly renovated library (one room of books with four new computers and a projector in the middle) and, at some future date, to have lunch at his residence. Somewhere during the exchange, I believe he also invited me to mow his lawn, likely a joke that lost its humor when translated. The setting for this meeting was the Mayor’s office, with a long conference table at the head of which, perpendicularly placed was his desk. Throughout the session, he smoked from his tobacco pipe and regularly checked his Blackberry. Overall, the meeting went well, the Mayor now knows that there is an American Volunteer in the village and that I am there to help in anyway that I can. Following lunch in the school Cantina, we went to the Rovit Winery just on the outskirts of the village; where a former student of the Viticulture School, who has now been working with Rovit for many years, greeted us. The gentleman walked the three of us through a tasting of four wines produced locally by the winery: in the order of Fetească Regală, Sauvignon Blanc, Fetească Neagra, and Cabernet Sauvignon. All were quite good, with my favorites actually being the two local Romanian varietals of Fetească Regală and Fetească Neagra. As an incentive for you to come and visit Valea, I will offer to show you a rather embarrassing video of myself sampling and critiquing the wines. One of the main challenges that the Vineyard seems to face is the same problem that much of Romanian agriculture is facing. As I understand it, directly or indirectly corresponding to Romania’s acceptance into the European Union, incentives have focused on imports from other European Countries thus stifling the agricultural prospective of farmers in Romania. As explained to me, in many cases, it is cheaper for Romanians to purchase wine imported from Italy than it is for them to purchase domestic wines. This is undoubtedly also impacted by the simple laws of supply and demand; if Italy is able to produce more and it their products are more highly demanded by the market in Romania then the prices would inevitably decrease. If domestic Romanian wines are more expensive to produce due to government imposed agricultural taxes, the market can only generate so much demand at the higher prices. To make things even more difficult the vines of Rovit are aging, and if new vines are not planted soon (which requires significant capital investment and five years of maturity) their production output could start to suffer. In the meantime, while they work through these challenges, I am going to enjoy all the Rovit Fetească Regală I can get my hands on. After a bit of free time and a short nap I was picked up and taken on a tour of Valea by two guides; a seventeen year old student from the high school and a twenty four year old graduate student that is related to one of the school’s staff. They took me to an old house up in the hills that once served as a vacation home for Nicolae Ceausescu, the former Communist Dictator of Romanian, who was ousted in December 1998 during the revolution. The home is quite large, tucked into the hillside and surrounded by trees. 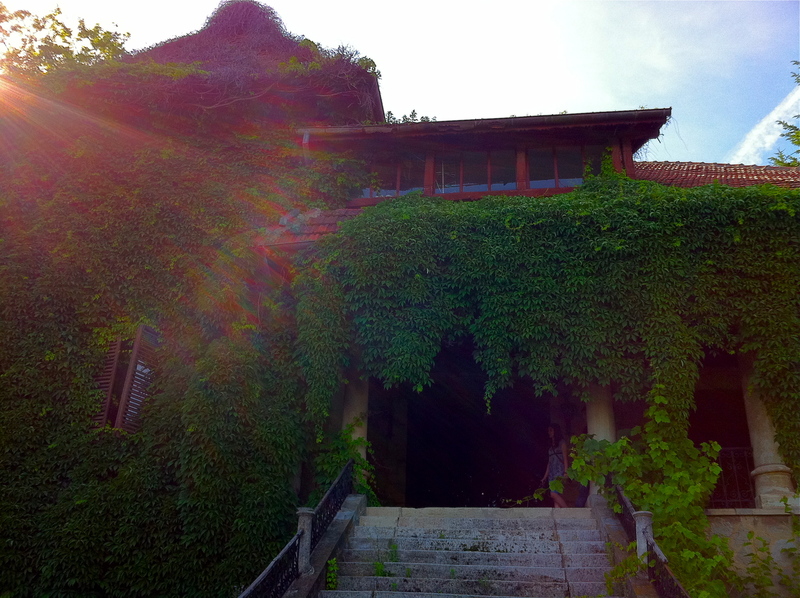 Green vines with massive leaves shroud the exterior of the home, covering some amazing stonework. We were supposed to be accompanied by someone with keys to the building but in typical Romanian fashion, plans shifted at the last moment and we were unable to see the interior. 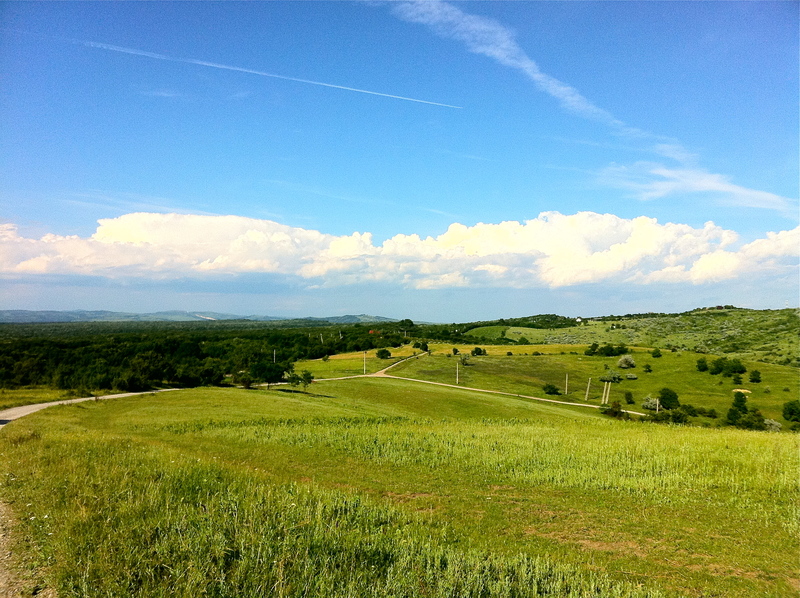 We used the spare time to go for a short hike and enjoyed the scenic view of the rolling hills. 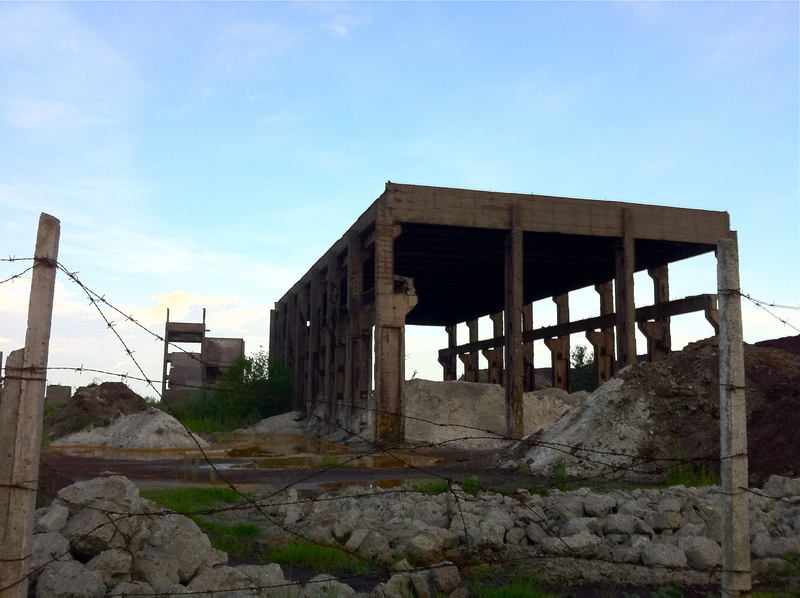 From our vantage point we could see the remains of a decommissioned gold processing plant on the outskirts of town. Apparently, in the plant’s heyday there was a perpetual cloud of sulfur that would regularly blow across town when the winds were just right. Lucky for me, the plant is nothing but ruins today; an eerie sight, as though a low-yield nuclear bomb had gone off in the middle of a small city. The framework of five and six story buildings still stands, but all of the windows have been blown out and rubble piled everywhere. This was perhaps an ominous site welcoming a potentially over eager Peace Corps Volunteer. Rounding out the night, the three of us headed to dinner at the Colina Grande Hotel. Translating, roughly, to “big hill”, not to “big colon” which is what first crossed my mind. This is actually a quite nice establishment nestled into the “center” of Valea. The hotel’s construction was completed a few years ago and still looks quite fresh and modern. Regardless the restaurant was not taking food orders, supposedly because the hotel had a full booking that night. 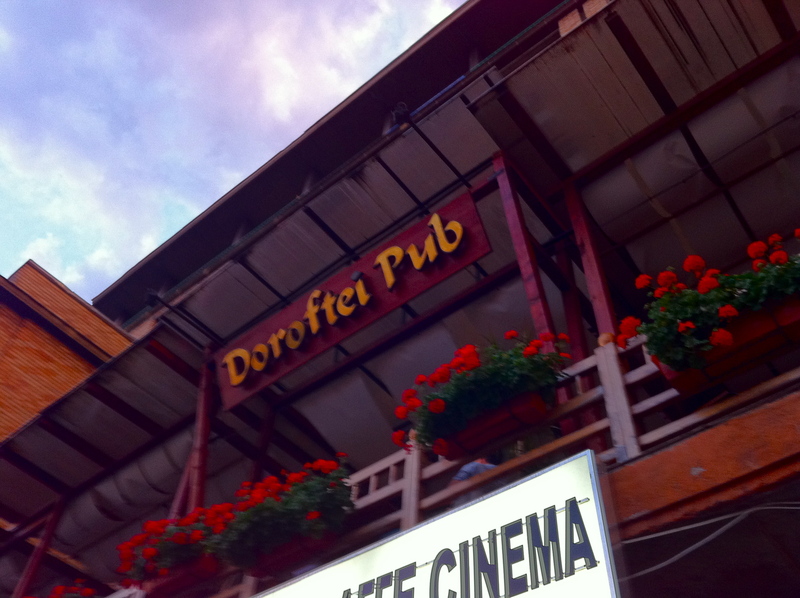 Undefeated, we decided to venture the twelve kilometers into Ploiești for dinner at a restaurant called Doroftei Pub. My colleagues had pointed this establishment out the day before as we toured Ploiești. The restaurant is named for the owner and operator, famous Romanian boxer Leonard Doroftei. Remarkably in the industry of food service, Doroftei is still very much involved. In fact, on the way out we passed directly by him at which point he asked me in Romanian what I thought of the meal etc. I explained in broken Romanian that I was from America and spoke only a little of his country’s language. He immediately switched over to flawless English as we exchanged pleasantries and I went on to praise his restaurant for its excellent service, good food, and fun atmosphere. My companions dropped me off back at the school dorm just at dusk and headed off in their own directions. The end to another great day in Valea Călugărească. Part 4 should be posted tomorrow with additional photographs. Hey, Jer. Love the changes/editions, bio, and especially the addition of photographs. Can’t wait to see the video re wine critiquing when I visit. You rock, Dude.